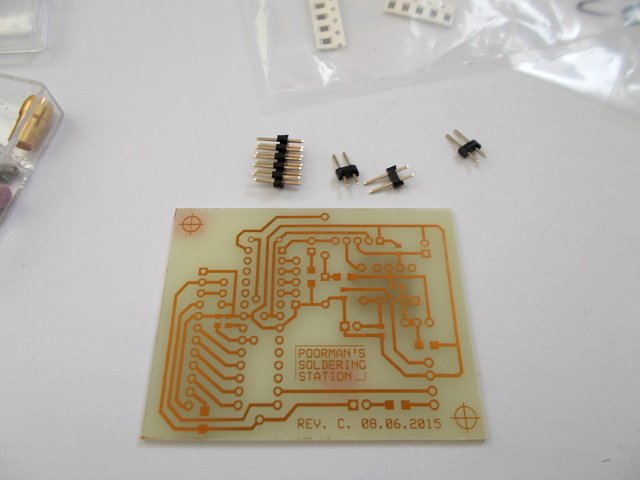 After having tested the prototype some more without finding any problems, I decided to work a bit to make a suitable PCB for the solding station. 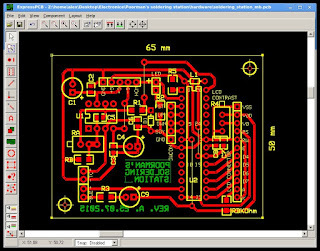 For this task I used a very nice freeware program called ExpressPCB. Luckily it works great in Wine and the design process went smoothly. 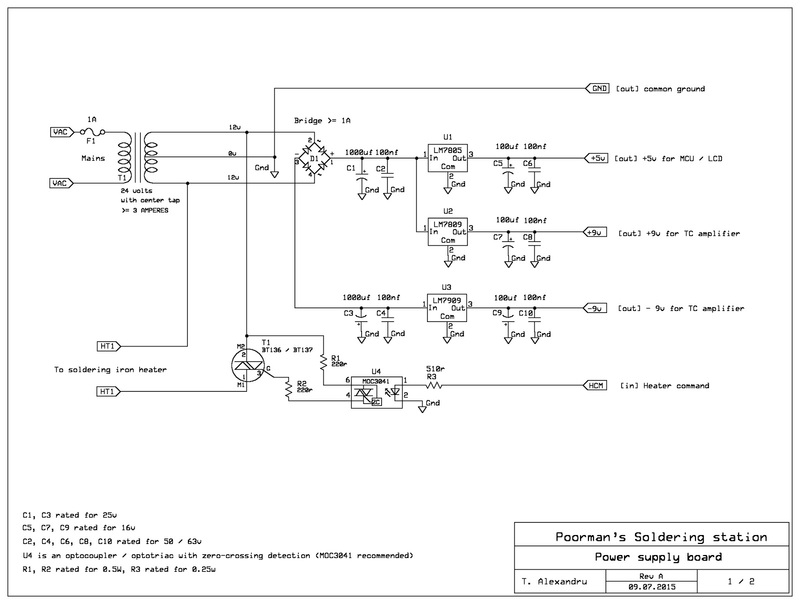 The download links for the PCB files are at the end of the article. Each module has its own PCB, this way it is easy to upgrade or fix without throwing away the good parts. 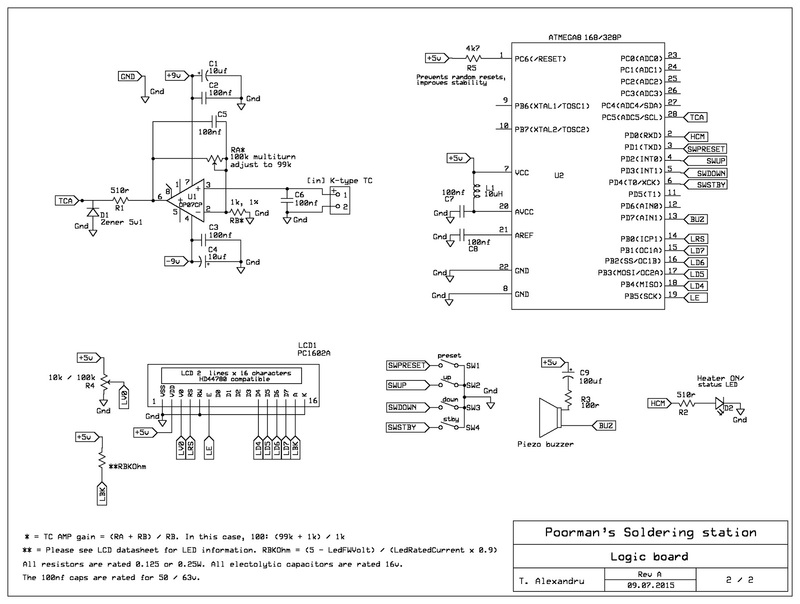 For the powerboard, I chose to use through-hole parts because it contains quite a few bulky components: the filtering electrolytic capacitors, the LM7805, LM7809 and LM7909 voltage regulators and the BT137 triac. 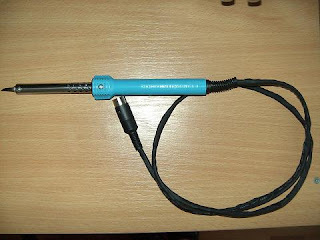 These need to be secured well and also be able to dissipate a bit of heat (theoretically, in practice the components remained cold in all tests). 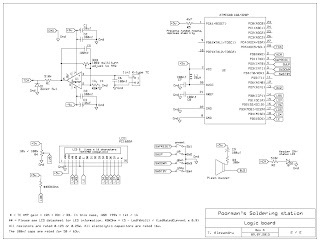 The main board uses some SMD parts, with a few exceptions (OP07 op-amp and the ATMEGA microcontroller, the electrolytic capacitors, the 2 multiturn potentiometers, etc.). 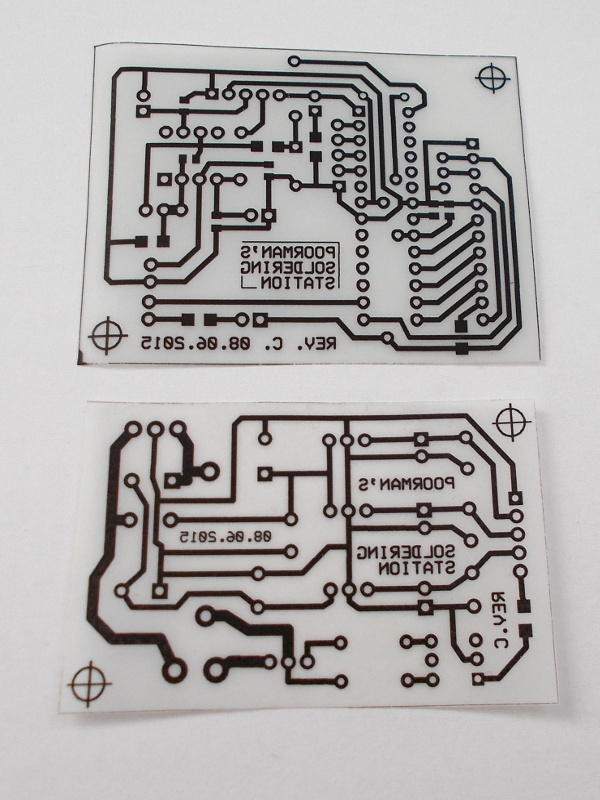 The current mainboard PCB uses resistors in 1206 package and capacitors in 0805 package. 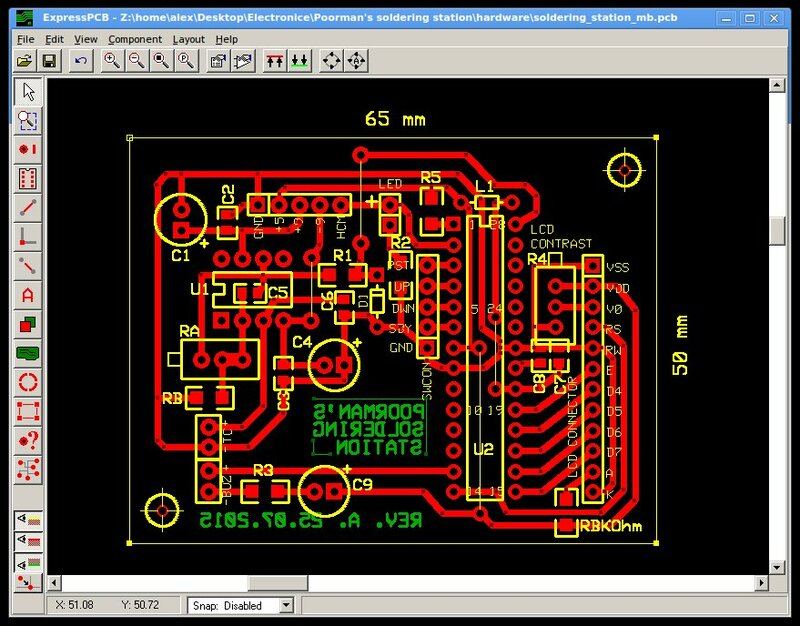 Since we're dealing with digital signals here, the SMD parts will help keep the resistance and inductance lower and also help achieve a smaller board. Depending on the final design and choice for the case, the four buttons can be mounted on a separate, smaller PCB (this is what I used). 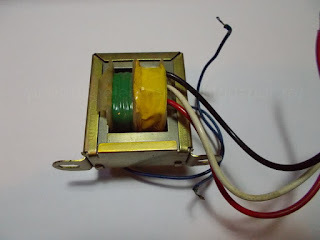 An alternative to this is to use pushbutton switches with central mounting which can be attached directly to the case. 1. 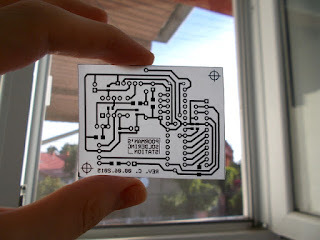 Print the PDF files on normal paper using a laser printer. 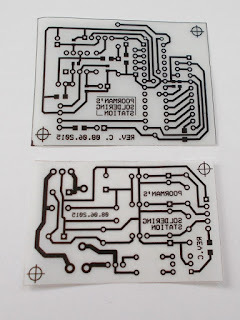 An inkjet printer works just as well, but in my tests, the laser printer made the traces more opaque and it didn't have any artifacts, while the inkjet-printed traces had a bit of noise around them. It could be that the paper I had wasn't very good. In any case, if you have a laser printer, use that one. 4. 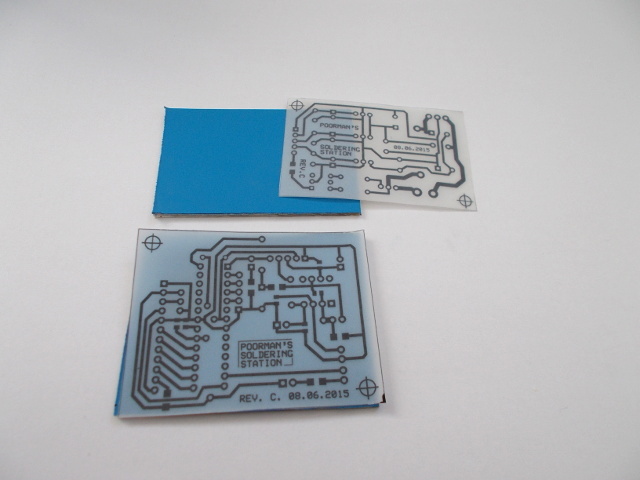 Expose the PCB to UV light. Have a look at the link above to see how to build an ultraviolet exposure box using UV leds. 5. 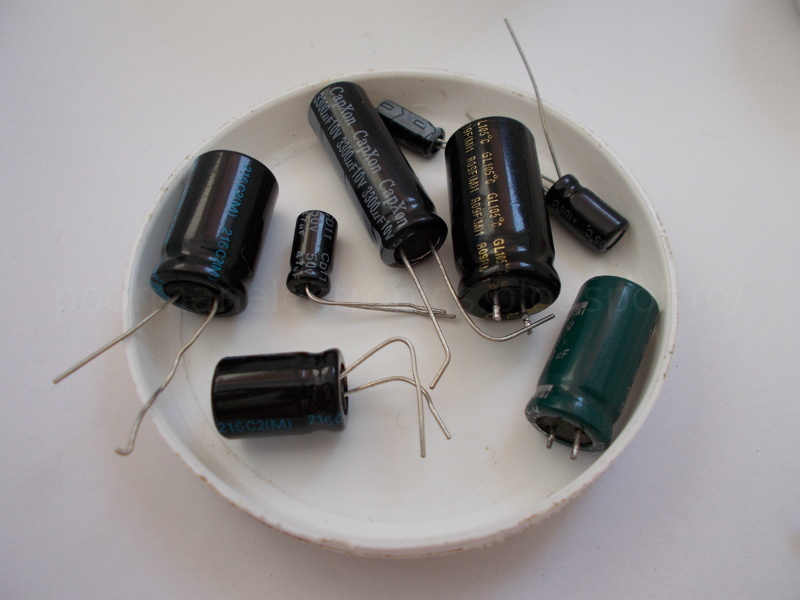 Remove the exposed photoresist layer with Sodium Hydoxide. I use 1-2 teaspoon of NaOH (~ 10 - 15 grams) to 1 liter of water. Make sure to avoid using metal when working with Sodium Hydoxide (glass, wood and plastic are OK) and to avoid touching it with your hand or you might get chemical burns. 6. Rinse the board with cold water, without touching its surface. Just immerse it a few times in water to remove the NaOH solution. 7. Etch the board. I used ferric chloride for this project, but special care must be taken not to touch it or spill its container because it permanently stains anything it comes in contact with. As with the NaOH solution, don't touch metal with it since it's highly corrosive. 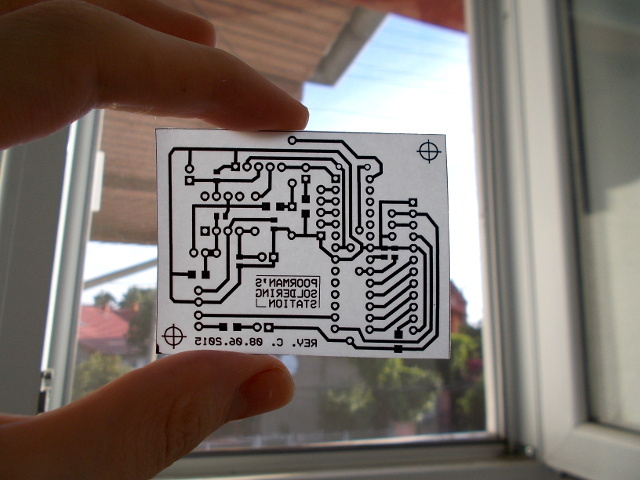 Make sure to etch the board in a well ventilated area. After the etching is done, dispose of the highly toxic etchant solution by taking it to your local disposal center. 8. 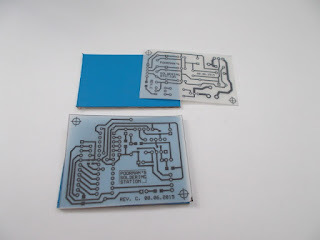 Carefully wash the PCB to remove the etching agent then clean it thoroughly with isopropylic alchool to remove the remaining photoresist from the traces. 9. 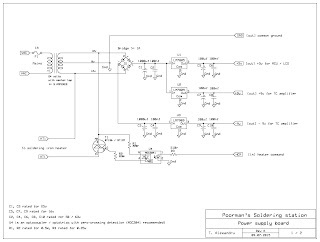 Test the traces with the multimeter's continuity test, drill the holes then solder the components. Next up is the firmware. I'll keep you posted. 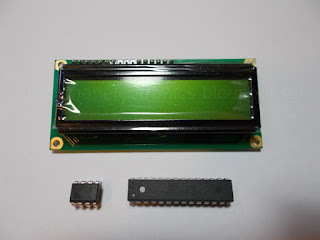 My name is Alex and I decided to create this blog in order to share with you some electronics projects that I decided to build and play with. I am not an expert in this field but I do like it very much and plan on learning more about it on the way. I hope you'll learn new things from the coming projects :-).